The Bank of England (BoE) has released a new report which highlights the geopolitics and cybersecurity risks to the UK’s financial stability. The Financial Policy Committee (FPC), a branch within the BoE, aims to ensure the UK financial system is resilient to and prepared for risks. Firms must take action to resist and recover from cyberattacks. Working with other organisations, like the National Cyber Security Centre, the bank will test that firms would be able to meet the FPC’s standards for recovering services. Continued reliance of financial markets on Libor poses a risk to financial stability that can be reduced only through a transition to alternative rates. Levels of household and corporate debt remain below their 2008 levels, before the recession. Credit growth remains broadly in line with the growth in nominal GDP, and debt‑servicing burdens are low. Non‑bank lending to riskier companies has been expanding rapidly, but lending by banks has been muted. At the same time, consumer credit continues to expand rapidly, to which the FPC acted last year to mitigate losses. Banks are looking more and more into mortgage lending; weak demand has kept mortgage credit growth modest. FPC has acted to kept standards demanding and relevant. Increases in Italian government bond yields suggest rising risks in the euro area, created by high public debt levels and interlinkages between banks and sovereigns in a currency union. Tightening conditions in US dollar funding markets are increasing risks in some emerging markets. Trade tensions have intensified. Debt levels in China remain highly elevated, and corporate leverage in the US has continued to increase. The UK is more vulnerable to a reduction in foreign investor appetite for UK assets, as the share of capital inflows vulnerable to refinancing risk has risen, and material global risks could spill over to the UK. The FPC judges that Brexit risks do not warrant additional capital buffers for banks. The report states that the FPC will attempt to mitigate any potential disruption caused by Brexit. An implementation period has been agreed, now that the EU (Withdrawal) Bill has been passed by Parliament. 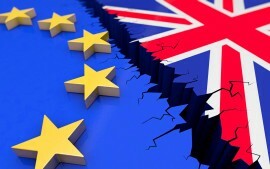 The UK government will make sure EU‑based financial companies continue to provide financial services to UK end‑users. It will take measures to mitigate a number of risks of disruption to UK customers.